Inspired by the Apple design philosophy, the Matias Wireless Aluminum Keyboard attempts to add function to the Apple product that clearly focused on form. For number crunchers, a dedicated numeric keypad is not optional, and this keyboard provides one without sacrificing the wireless functionality. 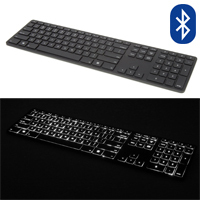 This keyboard will also pair with up to 4 different Bluetooth devices and adjust its layout to be compatible with the device for non-Mac systems (i.e. Android, Windows, iPad, etc.). A surprisingly long-lasting 1600 mAh battery allows this keyboard to work for an entire year without recharging. The extra capacity afforded by this battery allows this long life without the need to power down and disconnect during idle periods. This makes this wireless keyboard perform more like a wired keyboard in that it is always connected and ready without a “wake up” period. This keyboard only weighs 1.18 lbs and comes in four different colors which align with the current mosaic of colors of the MacBook – Silver, Space Gray, Gold and Rose Gold. Inspiré par la philosophie de conception de Apple, le clavier Matias Wireless Aluminum Keyboard offre la fonctionnalité supplémentaire aux produits d`Apple qui concentre clairement sur l`apparence. Pour utilisateurs qui sont dévoreurs de chiffres, un pavé numérique séparer n`est pas un option, et ce clavier offre un sans sacrifiant la fonctionnalité d`être sans fil. Ce clavier peut fonctionner avec jusqu`à 4 autre dispositifs Bluetooth et peut aussi s`ajuster la disposition pour qu`il soit compatible avec les ordinateur non-Mac (c`est-à-dire Android, Windows, iPad, etc.). La pile 1600 mAh a une très longue vie qui permet ce clavier de fonctionner pour une année entier sans avoir besoin d`être recharger. Cette capaciter de la pile offre une longue vie sans avoir besoin d`éteindre et de débrancher durant les temps de repos. Cela fait ce clavier sans fil agir plus comme un clavier avec fil de sorte qu`il est connecté en tout temps et prêt à fonctionner sans avoir une période de “se réveiller”. Ce clavier à un poids de seulement 1.18 livres et est disponible en quatre différentes couleurs qui sont le même des couleurs courant du MacBook – Argenté (Silver), Gris (Space Gray), Or (Gold) et Or Rose (Rose Gold). The Matias Wireless Aluminum Keyboard with Backlight adds yet another feature to the Matias Wireless Aluminum Keyboard inspired by iconic original from Apple - backlighting. With its own dedicated rechargeable battery just for the backlighting, this version of the Wireless Aluminum Keyboard lets the user control the brightness of the backlight in 10% increments from 0 to 100% using keys on the keyboard. With normal usage during the evenings and night, estimated time between charges is about 1 to 2 weeks. The rest of the keyboard is identical to the standard Wireless Aluminum Keyboard. For number crunchers, a dedicated numeric keypad is not optional, and this keyboard provides one without sacrificing the wireless functionality. 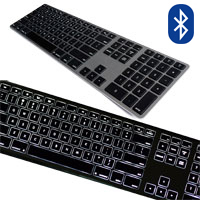 This keyboard will also pair with up to 4 different Bluetooth devices and adjust its layout to be compatible with the device for non-Mac systems (i.e. Android, Windows, iPad, etc.). A surprisingly long-lasting 1600 mAh battery allows this keyboard to work for an entire year without recharging. The extra capacity afforded by this battery allows this long life without the need to power down and disconnect during idle periods. 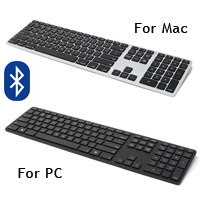 This makes this wireless keyboard perform more like a wired keyboard in that it is always connected and ready without a "wake up" period. This keyboard only weighs 1.18 lbs and comes in two different colors — Silver and Space Gray. Le clavier Matias Wireless Aluminum Keyboard with Backlight de Matias ajoute encore une autre caractéristique au clavier Matias Wireless Aluminum Keyboard inspiré par l'original iconique d'Apple - rétroéclairage. Avec sa propre pile qui est rechargeable dédiée au rétroéclairage, cette version du clavier Wireless Aluminum Keyboard permet à l'utilisateur de contrôler la luminosité du rétro-éclairage par incréments de 10% de 0 à 100% à l'aide des touches du clavier. Avec une utilisation normale le soir et la nuit, le temps estimé entre les charges est d'environ 1 à 2 semaines. Le reste du clavier est identique au clavier Wireless Aluminum Keyboard. Pour utilisateurs qui sont dévoreurs de chiffres, un pavé numérique séparer n`est pas un option, et ce clavier offre un sans sacrifiant la fonctionnalité d`être sans fil. Ce clavier peut fonctionner avec jusqu`à 4 autre dispositifs Bluetooth et peut aussi s`ajuster la disposition pour qu`il soit compatible avec les ordinateur non-Mac (c`est-à-dire Android, Windows, iPad, etc.). La pile 1600 mAh a une très longue vie qui permet ce clavier de fonctionner pour une année entier sans avoir besoin d`être recharger. Cette capaciter de la pile offre une longue vie sans avoir besoin d`éteindre et de débrancher durant les temps de repos. Cela fait ce clavier sans fil agir plus comme un clavier avec fil de sorte qu`il est connecté en tout temps et prêt à fonctionner sans avoir une période de “se réveiller”. Ce clavier à un poids de seulement 1.18 livres et est disponible en deux différentes couleurs — Argenté (Silver), et Gris (Space Gray). The new Kinesis Freestyle2 Blue Keyboard is an extremely versatile ergonomic Bluetooth keyboard. 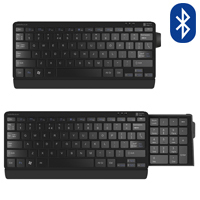 This innovative keyboard offers all the same features as the corded Freestyle2, with the added convenience of a Multichannel Bluetooth connection. 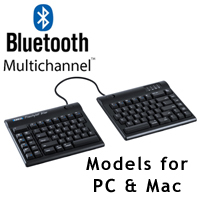 Kinesis' unique Multichannel technology enables users to instantly switch keyboard input between up to three Bluetooth devices (smart phones, tablets, laptops, etc.) The Freestyle2 Blue eliminates the wait while a connection is established and paves the way to increased efficiency and improved productivity. Two models, one for PC and one for Mac, ensure that users on both platforms benefit equally. This low-profile keyboard is divided into two separate modules connected by a 9" or 20" cable, and is dramatically thinner and more portable than the original version. The modular design allows the user to configure the keyboard in its optimal orientation, either by splaying the modules at any angle or by adjusting the distance between the modules up to 9" or 20". Optional accessory kits provide additional keyboard configurations, including the ability to tent the modules at set angles of elevation, or to add a separate matching numeric keypad. Note: With full separation on the 9" cable model, the distance between index finger to index finger on the home row is approximately 12". The VIP3 Accessory Kit for the Freestyle2 provides the ability to tent the keyboard modules (i.e to create lateral slopes) at 5°, 10° or 15°. Palm supports are included with this kit and must be attached in order to use the tenting mechanism. The V3 Accessory Kit provides the option of a tenting mechanism without integrated palm supports. The V3 offers tenting of 5°, 10° and 15° and would be a suitable option at a workstation where palm supports were already in use. Note: The V3 Accessory Kit is not compatible with the optional Palm Support Accessory Kit. The more specialized Ascent Accessory Kit provides two multi-angle tenting modules that attach to the underside of the keyboard's two modules. The Freestyle2 Numeric Keypad (corded) seamlessly matches the low-profile design of the Freestyle2 keyboard and features the same proven low-force, quiet and tactile membrane key switches. The Low Force Tactile Numeric Keypad (corded) provides a more durable option for heavy duty use. This keypad has a wider, higher profile and low-force tactile mechanical key switches with a longer operating life. For more information see our Keypads category. 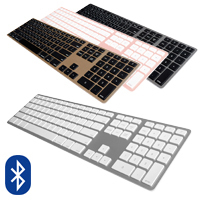 The Matias Wireless Multi-Pairing Keyboard is for individuals who miss the Apple Wired Keyboard but want to pair up to 4 Bluetooth devices at the same time, making it easier to switch between four devices with the simple press of a button. The Matias Wireless Multi-Pairing Keyboard is compatible with Mac OS X all the way back to Version 10.6.8 (Snow Leopard) and is available in Silver (FK416BT). The PC model ( FK416PCBT) is Windows compatible and is available in Black only. The Posturite Number Slide Compact Keyboard helps to reduce the risks associated with overreaching for the mouse without sacrificing the convenience of an integrated numeric keypad. Housed within the body of the keyboard, the numeric keypad remains tucked out of the way until needed, allowing the user to keep the mouse within the Comfort Zone. When the number pad is needed, it slides easily and smoothly into position. The keyboard features dampened scissor-switch keyswitches with chiclet (or island-style) key caps. At 19 mm, the key pitch (i.e. the distance from the left edge of one key to the left edge of the adjacent key) is the same as the key pitch on a standard-sized keyboard. The keyboard is equipped with two USB ports and has PROTX2™ antimicrobial product protection incorporated into the materials. At only 11.6" wide (with numeric keypad retracted) and 15.3" (with keypad extended) the keyboard is well suited to mobile applications or to occasional use in confined spaces. Two models are available: a wired version, and a Bluetooth version. The wired model is compatible with all versions of Windows, and Windows Mobile. The Bluetooth version adds support for both iOS and Android mobile devices. The Goldtouch Go!2 Mobile Keyboard balances the opposing demands of ergonomics and portability. Like the Goldtouch desktop keyboards, (GTN-0099, GTN-0088, GTN99-FC), the Go!2 Mobile Keyboard can be splayed to reduce ulnar deviation; tented to reduce pronation; or both tented and splayed. Weighing only 1.1 lbs, and only 13.5" wide when in use, the keyboard is easily folded in half for compact storage and transport. Quiet, full-sized scissor-switch membrane keys are legended for both PC and Mac operating systems. While the surface of the keyboard is flat, the housing of the Goldtouch Go!2 Mobile Keyboard has a slight positive incline when the keyboard is not tented. 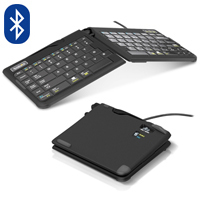 The Goldtouch Go!2 Mobile Keyboard is available in both wired and Bluetooth models. Warning: Those who use the Goldtouch Numeric Keypad with a Goldtouch Go!2 Mobile Keyboard should be certain to plug the keyboard directly into the computer, or into an external USB hub. Connecting a keyboard to the computer via any of the ports on the Goldtouch Numeric Keypad can cause both devices to malfunction. The M-board 870 Keyboard from Bakker is a compact bluetooth keyboard incorporating Bluetooth 3.0 technology compatible with iOS, Android and Windows. This keyboard also includes multi-pairing bluetooth technology so that one can quickly switch between typing on a laptop, tablet or smartphone. The compact design of the M-board 870 eliminates the numeric keypad, making reaching for the mouse more comfortable by reducing the distance to the mouse. The M-board 870 features laptop styled short travel scissor-switch keyswitches. 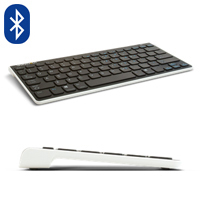 Key Ovation's Goldtouch Wireless Bluetooth Mini Keyboard is an ideal keyboard for mobile computing. 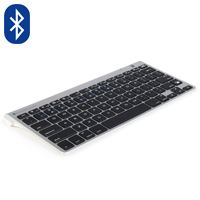 This Bluetooth wireless keyboard is portable and easy to carry around and is compatible with a wide range of different mobile devices from PC's and laptops to tablets and cellphones (it is also compatible with Windows, Mac, or Android operating systems). Other features include an embedded numeric keypad, access to multi-media functions, and battery info indicator lights. The Matias Laptop Pro Keyboard is the quietest mechanical compact keyboard currently in production. It features full size, full travel keys with standard key pitch all but eliminating adaptation time. The keyswitches are Quiet Click mechanical keyswitches, providing the speed, comfort and tactile feedback of a mechanical keyboard, without the typical accompanying noise. 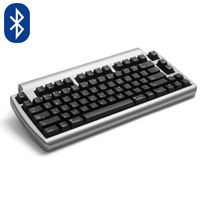 The bluetooth interface makes it easy to use with any bluetooth enabled device, and the reduced form factor makes it more portable than traditional full-size keyboards. It has Mac friendly function keys ensuring full access to features on Macs, iPads, IPhones, iPod Touches and Apple TVs...but it will also work with bluetooth enabled PCs, Android 3.0+ smartphones and tablets. There are 2 USB ports on the keyboard which when plugged in allow you to either charge the keyboard or charge up to 2 other USB devices (while you are charging the keyboard).